Shiplap is currently one the most popular interior design trends. 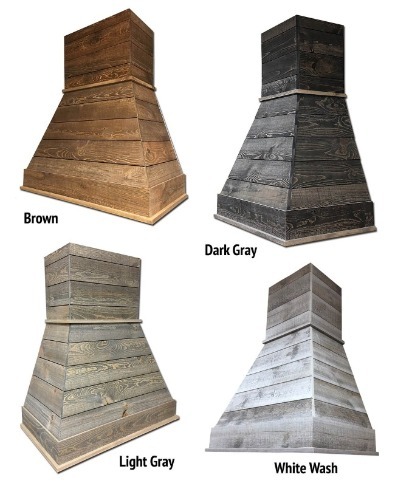 The Castlewood SY-WCSLR Rustic Shiplap Range Hood is constructed with weathered spruce planks and is pre-finished with a Sherwin-Williams water based stain. 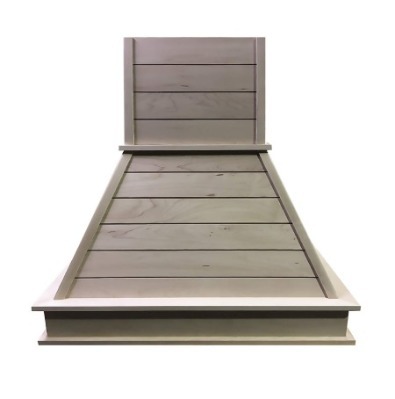 Four different shiplap color options are available including Brown, Dark Gray, Light Gray, and White Wash. This piece will add beauty and value to any rustic farmhouse kitchen design. Available options include liners, ventilators, chimney extensions, and ductless kits. 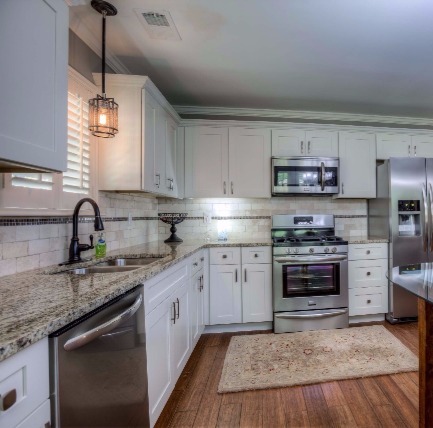 One of the latest kitchen design trends is the use of reclaimed lumber. This material is commonly referred to as Shiplap. Castlewood's SY-WCSL Shiplap Smooth Chimney Range Hood employs the shiplap look and construction and is sanded smooth and ready for finishing. Handcrafted in the southern United States, each Shiplap hood is a truly unique piece that will serve as the centerpiece of your kitchen. Available species include Alder, Cherry, Hickory, Maple, and Red Oak. Liners, ventilators, chimney extensions, and ductless kits are also available. Add warmth and character to your kitchen design with our wood range hoods. Ready-to-assemble cabinets with Hook-Loc© assembly for quick installation. Tool-free adjustability allows users to move shelves up or down after kitchens installed. Century Components X2 Bracket System offers unmatched adjustability and is a must have in any kitchen. Never worry about drawer slide placement again with this tool-free adjustability solution. The X2 Bracket System provides high-quality, tool-free adjustability for roll-out shelving systems. Installation is quick and easy for kitchen builders and simple to use and adjust for consumers. The X2 Bracket is compatible with both side and undermount slides. Compatible with Blum, Grass, Salice, Hettich, Knape and Vogt, Accuride, Repon, and most standard slides. The X2 Bracket is also compatible with the Landslide Undermount Slide, which we offer. Castlewood Epicurean Hood Featured on My Houzz! Clay Matthews LOVES the Epicurean Chimney Hood and you should too. This episode features the Green Bay Packer linebacker tackling a surprise renovation for his brother and sister-in-law. Our Castlewood Epicurean Curved Chimney Hood is the centerpiece of the kitchen remodel and looks absolutely stunning. 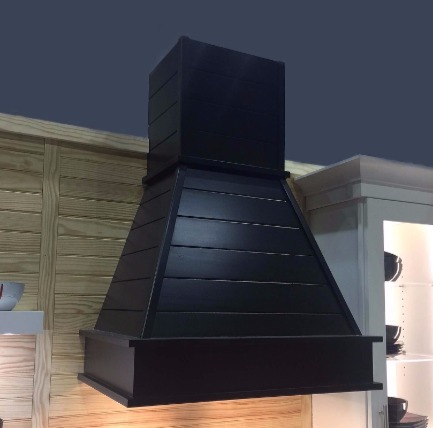 The Castlewood Curved Epicurean Chimney Range Hood is the taller version of the popular Gourmet Hood design. 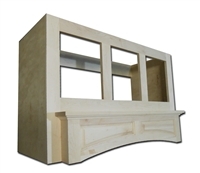 This elegant model will make a bold statement within your overall kitchen design. Available Species include Alder, Cherry, Maple, and Red Oak. Are you a Kitchen and Bath dealer? Cabinet manufacturer? See if you qualify for our trade program by submitting our Trade Program Form. Form can be filled out here.